There’s a new data-storage startup in town. This one has some pretty big parents and distributors—and it’s hitting the ground running. Specifically, its parents are EMC (NYSE: EMC), the largest tech company in the Boston area, and Lenovo (HKSE: LNVGY), the Chinese computer and server giant (now reputed to be the world’s biggest PC maker). 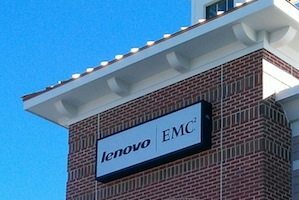 Their joint venture, called LenovoEMC, opened at the end of December in Hopkinton, MA, just a few blocks down the road from EMC headquarters. On a recent visit, I found an unmarked office on the second floor of an unassuming strip mall. LenovoEMC has 6,000 square feet of office space and about a dozen employees in Hopkinton; the spinoff has some 30 people total, distributed between Massachusetts, Utah, Colorado, North Carolina, and Washington state. The joint venture, majority owned by Lenovo (51 percent), was first announced last August with the stated goal of selling network-attached storage—hardware and software for storing files and sharing them over the network—to small and medium-size businesses. But it has taken the parent companies until now to dot their i’s and cross their t’s. As I see it, LenovoEMC’s objective is to lead storage innovation for Lenovo’s server and storage initiative as the PC market declines; in turn, the broader partnership helps EMC gain traction in emerging markets such as China and Latin America, where Lenovo’s sales and reputation are strong. Roughly speaking, then, EMC brings the storage, and Lenovo brings the servers and PCs. And both bring enterprise sales and distribution channels to the table. “We’re trying to take the best of EMC’s and Lenovo’s cultures to create a startup, with the best of all three worlds,” says Eric Arcese, the president and general manager of LenovoEMC (and a longtime EMC exec). Sounds like a strong premise—but it will be challenging. For one thing, every startup needs a niche. LenovoEMC’s is in selling lightweight storage systems to small businesses, law offices, and branch offices of banks and other corporations. In that way, the startup will target both small companies and enterprises. “Big companies need small storage too,” says Jay Krone, managing director at LenovoEMC (pictured below). He adds that the new startup is atypical. “We’ve got real products,” he says. Krone, a 15-year EMC veteran, took some time to show me around the new Hopkinton office. There was a big conference room with a high-end videoconferencing system (essential for a distributed startup); a demo room with the latest Iomega networked products; a “dog food” lab filled with EMC/Iomega storage appliances and Lenovo servers (where they test and use their own hardware and software, pictured below); and perhaps most tellingly, plenty of space to grow. LenovoEMC’s current competitors include Netgear, Synology, and Buffalo Technology. If all goes well over the next few years, it might even challenge the likes of NetApp and Dell. But it’s also interesting to consider what impact the startup will have on its parent companies. It has been said that the best companies disrupt themselves—think Apple with its MacBooks, iPads, and iPhones. So it struck me as interesting that LenovoEMC is, in effect, looking to disrupt the networked storage market from within. “You could look at us as a tiny Isilon,” Krone says. (That would be Isilon Systems, the network-attached storage company bought by EMC for $2.25 billion in late 2010. Isilon makes higher-end products for bigger customers.) “We go where they’re not,” he says, adding that LenovoEMC is not trying to disrupt existing businesses at EMC. In fact, a broader goal is to expand EMC’s business globally. “From a strategic perspective,” Arcese says, “building a foothold in China is very important.” EMC has had a presence in China for years, but it needed a strong and credible local partner. Lenovo, led by CEO Yuanqing Yang, is now that partner. “When ‘YY’ speaks in China, everybody listens,” says Krone.